Viral video of a short concert by American Dixie band accompanied with no ordinary audience inthe French Alps. From complete anonymity became known worldwide on TV and internet. It happened this summer, near Grenoble, when the Dixie quintet The New Hot 5 quite spontaneously began to play jazz classic When the Saints … to the unusual audience, which responded quite unexpectedly. The audience were cows on the pasture chewing grass. When they heard the first bars of the tube they had forgotten the grass and one by one steped closer to the musicians lined up at the wire fence. Lined up did not even blink until the end of the concert. I was really laughing at this scene, cows were so cute. Within a few days after the publish on the YouTube, video became viral and popular across all media, play it in the most watched TV shows such as Conan O’Brain Show, Jay Leno, Good Morning America, Fox News … One month after the publication has already been through 1 million views on YouTube alone. Guess the address of the CD, which has just been released? 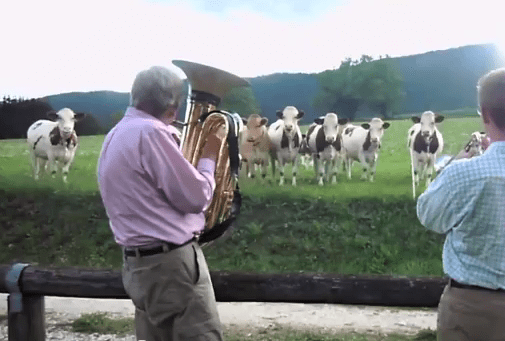 Jazz for Cows, of course ( as Youtube video title). If you are thinking hiring them, the contact is on their website, on which they joke about on their own account and write that play for people too. Now over 2 millions views of the video. This makes them the most viewed “Dixieland Jazz Music” and “New Orleans Jazz Music” Video in the history of YouTube! You can order The New Hot 5 (New Orleans jazz band) Jazz for Cows CD here . Hey! My brother has recommended me to have a look at your blog. And I’d like to say that I really respect what you’re providing here.